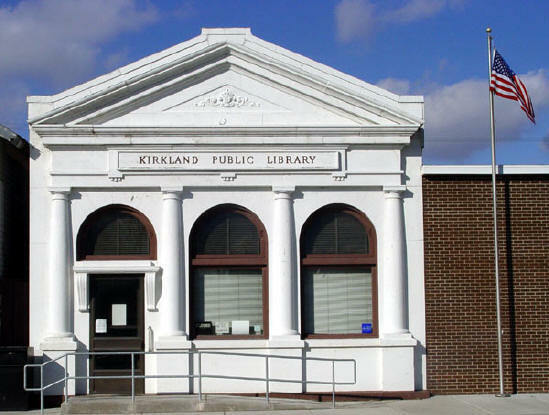 The present Kirkland Public Library is better known as the ‘old bank’. Once the State Bank of Kirkland, built in 1913, it was credited for being one of the only banks in the country that didn’t close during the Depression. The first inhabitants of this predominately wooded area were the Pottawatomie Indians. They were among the most peaceful tribes. They grew rice and corn and refined maple sugar. In September of 1835 the Pottawatomie along with the other Indians west of the Mississippi were removed in accordance with provisions of the treaty made at Prairie DuChein in 1832 at the close of the Black Hawk War. Some of their heritage remains as part of David Shriver’s arrowhead collection displayed in the Kirkland Library. Kirkland was named after William Thomas Kirk who built a log cabin here in 1837 to raise his nine children. By 1882 he had acquired 1,475 acres of land in the area. Until the appointment of a postmaster, the town was called Kirkwood. Since another post office had the same name, Kirkwood was changed to Kirkland. The Village of Kirkland became official on August 16, 1882. Kirkland has had the same form of municipal government since it was first organized: a president, a clerk, and six trustees. In 1875 W.T. Kirk agreed to give the railroad a portion of his land if every passenger train would stop at Kirkland. The Kishwaukee River’s course was changed and the railroad was built. The sheep business caused the railroad and town to grow. By law, sheep coming from the east could ride the rail 36 hours and Kirkland was that distance from Omaha, Nebraska, where millions of sheep began their journey to Chicago packing plants. The sheep would be watered, fed and sheared here. Many remember the “sea of white” that had to pass into the next pasture before they could continue to school. In 1946, the Brennan brothers leased the yard from the Milwaukee Railroad to run their cattle business. In 1956, they bought the yards from the railroad where the Brennan Cattle Company thrived. Eventually, the railroad dwindled from eight tracks to one. In 1971, all passenger service ceased, due to Amtrak. From pony express to railroad mail delivery, from eight railroad tracks to one, from sheep yards to Brennan Cattle Company, from any one thing to another, times change, people change, but Kirkland’s Heritage won’t.